Back to the garnet place this morning, only staying for the day, not camping. Dammit, I just heard rain on the roof! But the bureau still forecasts only a shower or two for the area, clearing through the morning. Radar shows a little patchy light rain over the area, cross fingers it's not enough to stop us. Not taking the heavy gear and I'm not going to work that bank of hard material, just the alluvial stuff in the gully bed. Best place to dig anyway, unlike the labradorite, these things are damn heavy and concentrate in low spots. Sun was coming out by the time we got there but they had received a little more than a light shower - the clayey ground was too wet to push through a sieve easily. Even the more gravelly stuff in the gully bed where I had intended to dig. But we chopped a heap of material down off the bank and I carted it two 5 gallon bucketfulls at a time up to the little box trailer we had our gear in and half-filled it with wash. I'll wash it at dad's place tomorrow, set up under his fruit trees so the water isn't wasted. As long as water isn't an issue, even a heavy clay wash is easily enough washed through by hose. Can't do that just dunking a sieve in a little drum of water on site, needs to be drier than that so you can shake out the fines first. 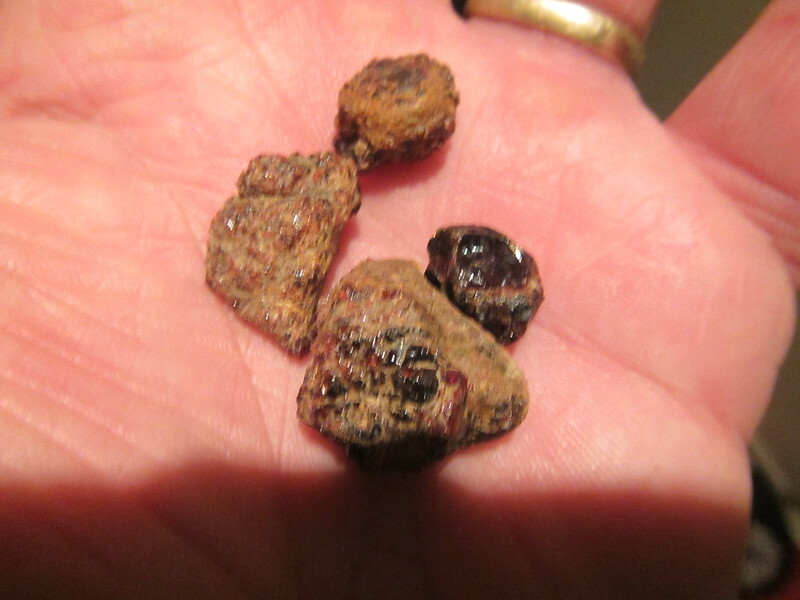 I did pick some stones out of the gully wall, exposed by the rain. There probably a few small faceting stones among them and I'd like to finally get round to trying a rose cut or Gem Ranger's Octo-tab. The interesting thing about this place is the rapid change in what you see on the ground. At the spot where we've been digging, the ground contains garnets, ilmenite, pleonaste, a small number of sapphires and a lot of shattered serpentine and some other unidentified rock which often has garnets and other stones embedded in it. Quartz is notable by it's near-absence. But about a quarter-mile back down the track - still on the same property - the ground is a mass of white quartz and it crops out here and there. Dad says the quartz lumps look the same as the sort that he often found associated with gold when he was an avid gold prospector in his youth. On the track in that spot, I picked up some odd little stones as we were leaving. They are rectangular prisms, so perfectly shaped I had to look closely to be satisfied that they hand't come out of something man-made. They look like they're made of some kind of ironstone or something. I've never looked at that end of the property, I think it deserves closer scrutiny. I'd love to see some pictures, Lefty. Going over to dads this morning to run the wash Barbra, hopefully there will be something worth photographing amongst it . I wish I could find garnets that look like Malai garnets but these ones are nearly all an overly-saturated dark blood red - beautiful vivid crimson when strongly backlit but the faceted stones are usually black with a few red flashes I did find one there that is more of a pinkish-red and you can hold the little cab (I wasn't faceting at the time) at waist height and read printed words through it without any powerful lighting and there's always a few that aren't quite as heavily saturated. And I did find one that is yellow-amber with greenish tints but was too small to facet. 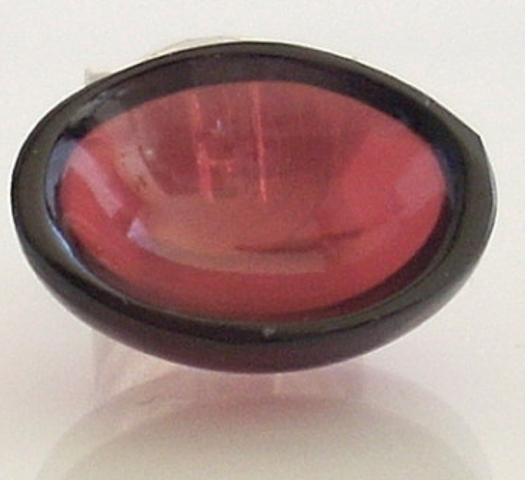 Even the shade of the Hartz range garnets they sell would be good. 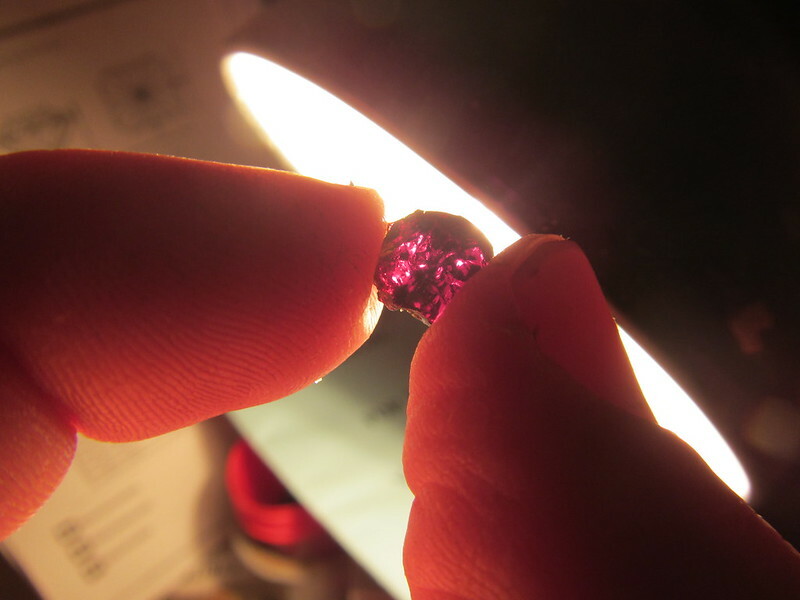 But I guess pyrope garnet does tend to be dark. 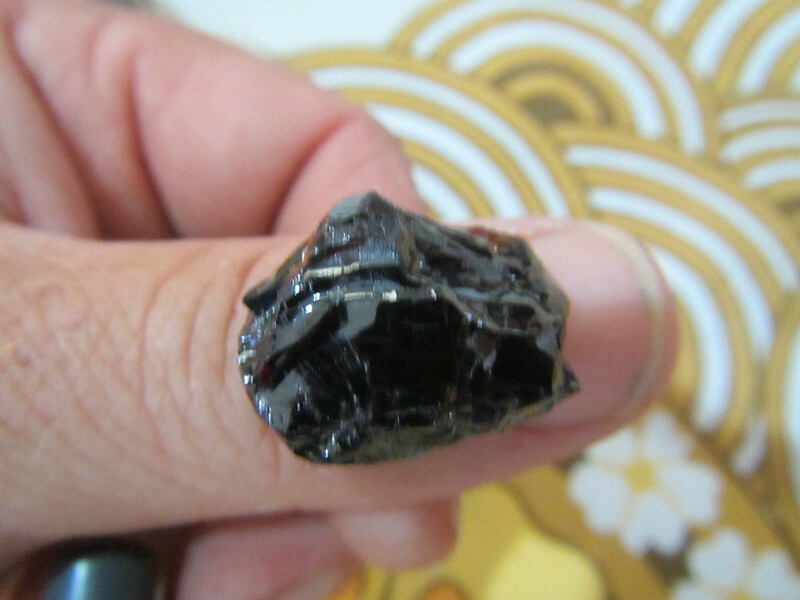 A friend found a 50 carat one at this place but while it looks pretty clean, I don't think I'd facet it, it would just be black. They are transparent in a low-domed cab, which I why I must get around to trying them in a rose cut and the designs Gem Ranger sent me. There are actually three other garnet deposits that I know exist in my area, all of them closer to where I live than this one. An old geologists report says that one deposit is of the andradite variety and occurs with epidote and wollastonite, I don't know what the other two are. But getting access is the problem. That garnet is really nice. 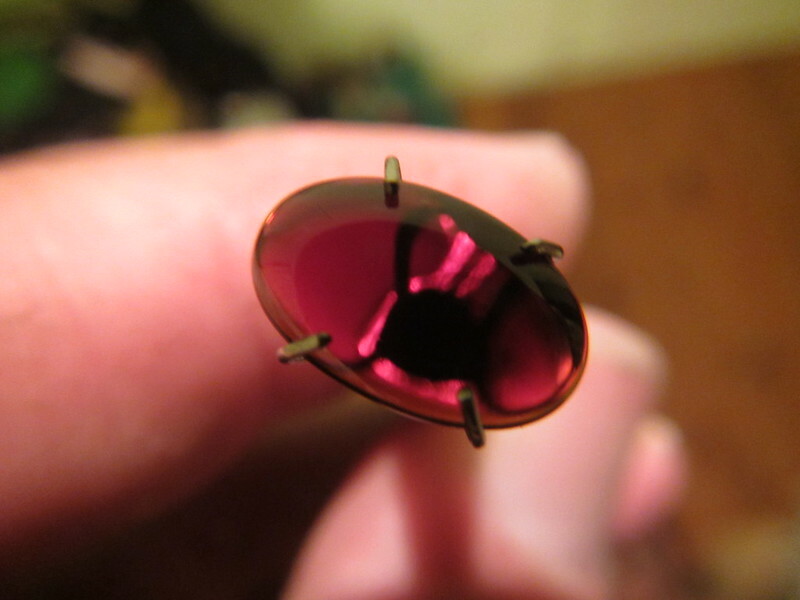 Have I ever told you about the Victorian trick of making overly saturated garnet cabochons concave? When set in mountings, it is really hard to detect. 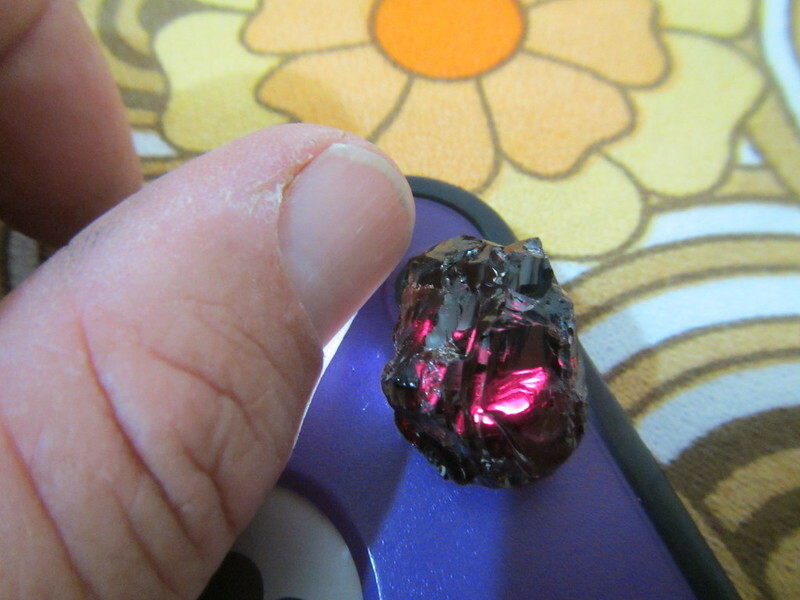 Some of the old Victorian garnets had a really exaggerated height but appeared to glow from within when mounted. Wow Barbra!!! That concave idea is brilliant! Brilliant idea Barbra! How would you do this - a little Dremel-type piece of equipment? My mate found this one a couple of trips back. It would be a great subject for the concave cab approach, as far as I know he hasn't done anything with it yet. This is the material the stones are originating from. 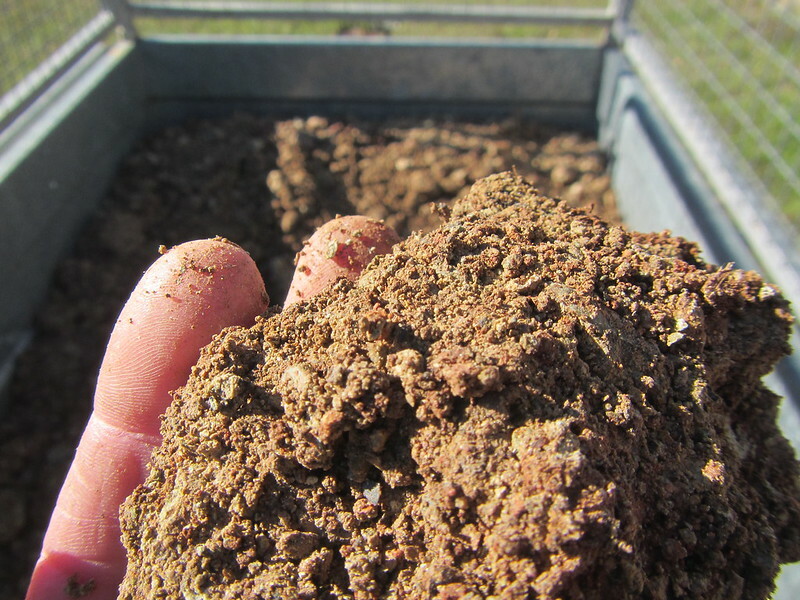 There are two distinct layers of clay (a bit jumbled together here), a red, somewhat friable clay overlying a greenish, very dense and plastic clay. Beneath that it becomes bouldery. Both the red and green clays carry the stone. Both contain a lot of shattered serpentine. 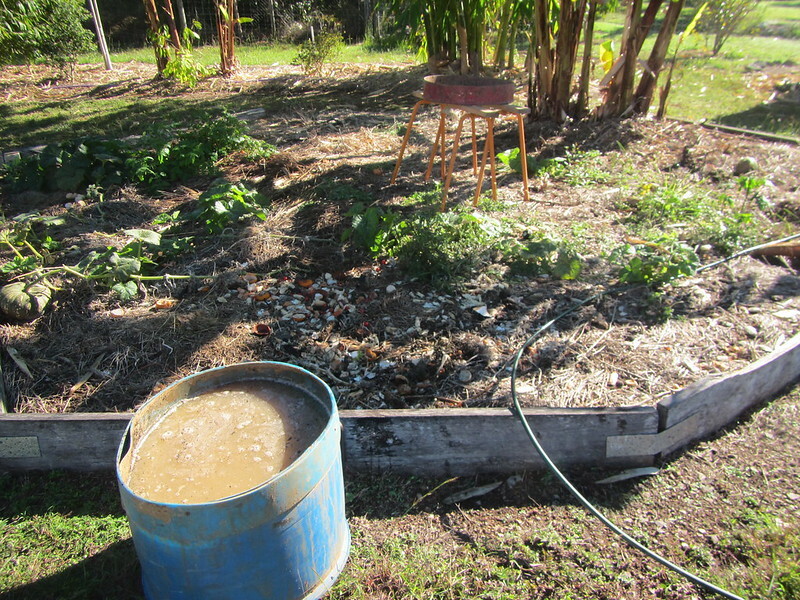 It was necessary to soak the clay to reduce it to a slurry that could be hosed through the sieve. The fines from running it through a 1/8th inch mesh are a mass of shining black. 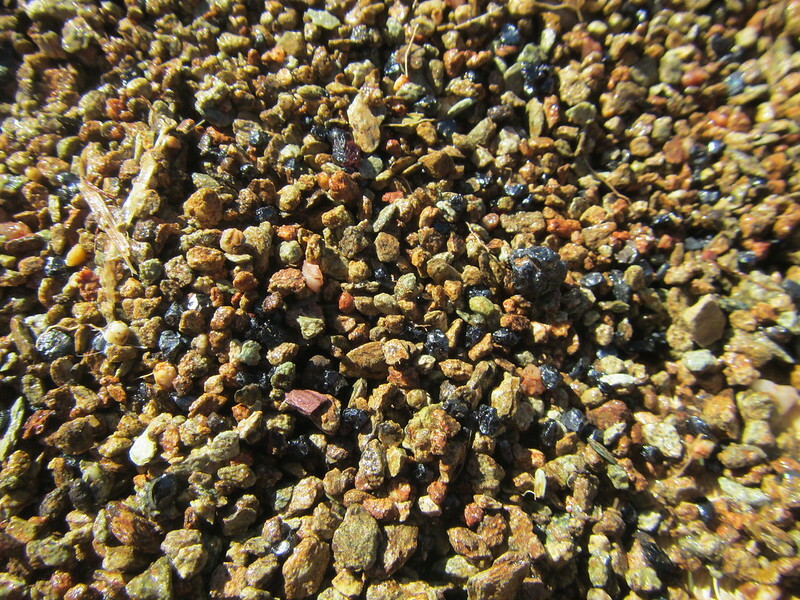 Most of this is black spinel and ilmenite with a smaller number of garnets and the occasional sapphire. Without mechanical assistance, running it through the small mesh is very slow and tedious and there is so much shiny black that it becomes distracting and strains the eyes. 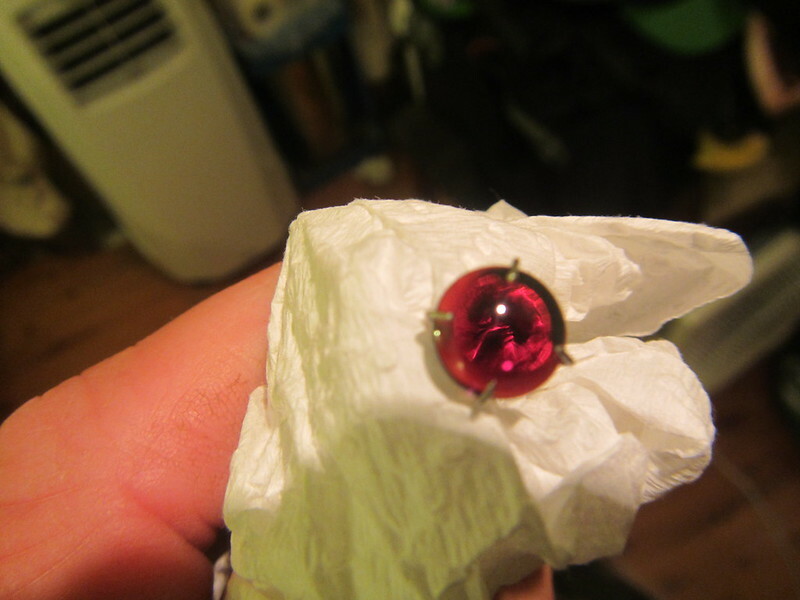 I went to the 1/4 inch but have kept the fines from that to wash at a later stage and probably run through the pulsator and hopefully pick out a few small sapphires just big enough to facet. 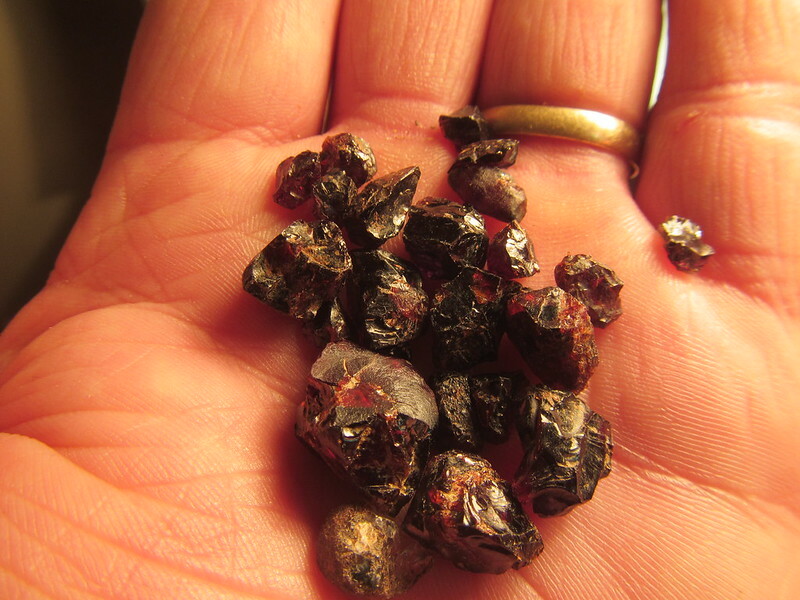 Too bad that most of what I got from this lot was just bits of shattered garnet crystal. Some of these ones will facet a small stone. Here are those little "xtals" I think the term is? Back down the track a little where the ground totally changes and white quartz abound and garnets appear absent. They look like they're made of hematite or something. They look like your classic hematite or ilmentite pseudomorphs after pyrite cubes. Easy to distinguish which with a quick streak test (in fact, one of the few cases where the streak test comes up). 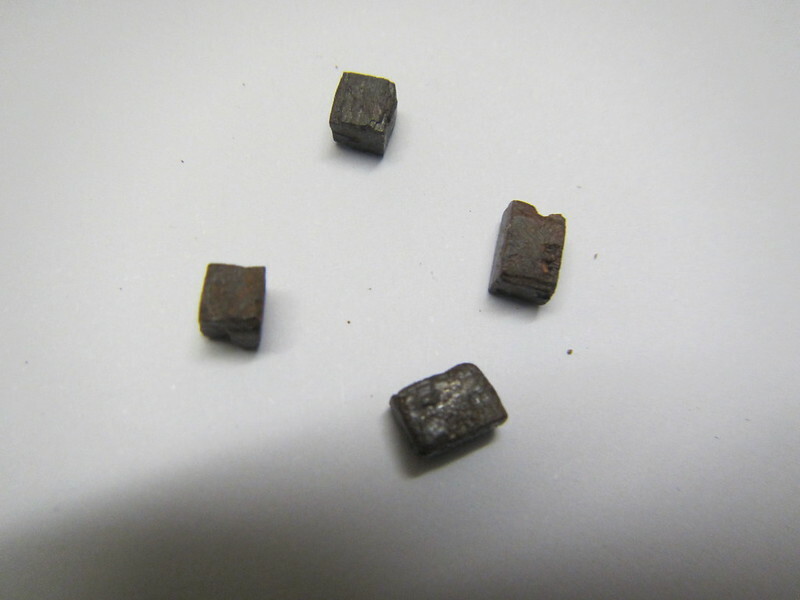 You can get pyrite cubes in all sorts of contexts. 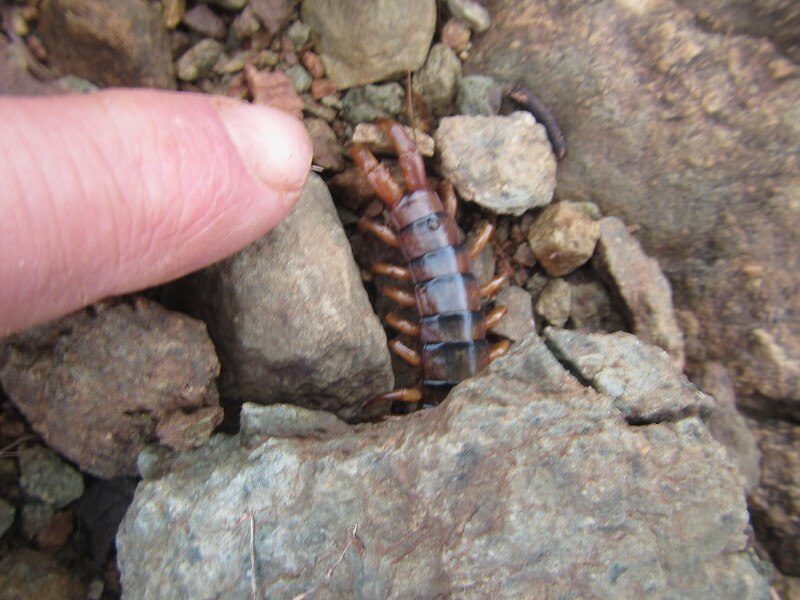 Nice centipede by the way! Did you get to see how long it was? No, he disappeared too quickly down a gap between the rocks. Needless to say, I shifted to another digging spot. 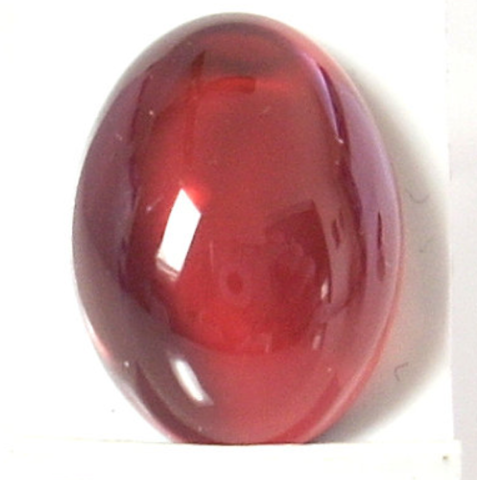 Streak is a definite red or brownish-red - hematite. I couldn't find a white porcelain tile and I knew I'd get in trouble if I scratched the toilet but the bottom of an old Christmas coffee mug worked just fine - it used to play Jingle Bells whenever you lifted it to drink but the translucent white plastic bottom fell off exposing unglazed porcelain and the little solar-powered music device got wet in the sink and croaked, think I might keep it for doing streak tests. So in the space of hundreds of metres we have pyrope garnet, ilmenite, black spinel, sapphire, hematite, quartz that resembles the gold-bearing/associated type - I wonder what else? Interesting spot.